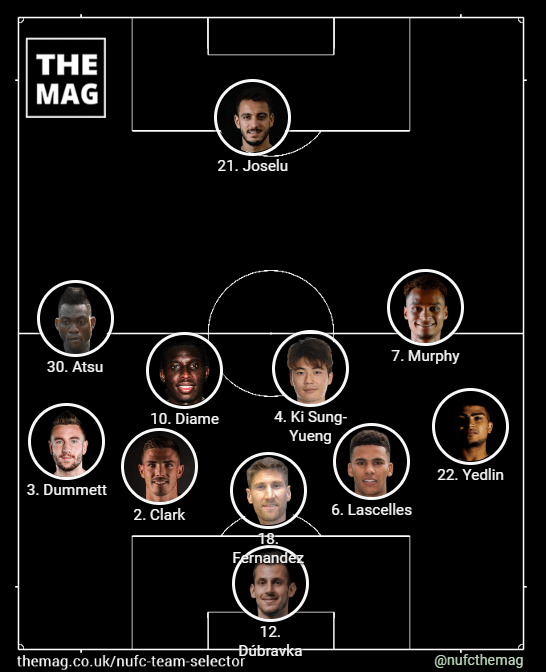 This Saturday sees surely the toughest challenge of the season, at least it is on paper…and money spent, the predicted Newcastle team v Manchester City below. Who will Rafa Benitez go for? On Friday afternoon, Rafa confirmed that Ritchie and Shelvey were out injured, but Lascelles is in the squad and available. Isaac Hayden is suspended, Lejeune still missing through injury, whilst Manquillo is back training but not fit enough to play any part at the Etihad. In January, Rafa Benitez went with a much changed team, despite having no midweek match before or after the Saturday game at Man City. Rafa Benitez hasn’t got a great deal of options but I think he may have the odd surprise selection. I actually think Hayden would have got a rare start, as like last season I could have seen the manager going for his and Diame’s defensive workrate in the middle of the pitch. Starting at the back, Dubravka is a no-brainer. Karl Darlow confirming on Wednesday night that there is only one Premier League keeper at NUFC. This will also be another chance for the three centre-backs to show the system can work, Schar has been poor and I think he will drop out to make way for Jamaal Lascelles. Maybe not ideal for Rafa having two big centre-backs in Lascelles and Fernandez playing, as well as Clark, against a short but mobile Man City forward line – but the former Swansea defender has been one of the few pluses so far. DeAndre Yedlin will hopefully feel the benefit of a rest on Wednesday night. Mohamed Diame will be the key player in front of the back five and I think Joselu will be given the thankless task of operating as the isolated lone striker, until Rondon is given the last 20 or so minutes, with hopefully Newcastle still in touch by that point. This leaves another three players to be selected. In a game like this it is a little fanciful to suggest players will be in any other position than being extra defenders, Ki Sung-yueng set to go in alongside Mohamed Diame in the middle. Both Atsu and Murphy were used in this fixture in January and both could well start again. Atsu was once again terrible on Wednesday but a bit like Joselu, the manager may look to see the winger doing a lot of the donkey work before bringing on maybe Perez and/or Muto, as well as Rondon, late on. Murphy has done ok up to a point this season but shown no sign of any kind of end product, certainly nothing similar to the quality goal he scored at the Etihad last season. Kenedy is having a bit of a nightmare in the last couple of matches and is another who may well be brought on late on if there is still anything to play for.